A minister from the Lutheran Church of Lincoln would come on Sunday afternoon to conduct the service in the Kaiser home. When he was not available, a Curtisville minister would substitute. In the summer of 1954, this small congregation rented out the "old soda bar/post office combination" which is now the Chat-N-Chew Resaurant in Glennie. Church service was held at 8:00 a.m.
On September 11, 1955, the congregation purchased the "old bank building," which is now the Lion's Club House in Glennie. They had difficulty getting a loan but eventually were successful receiving a loan through the Huron Community Bank in Tawas. While in this building, the parishioners bought pews for a $1.00 a pew. Once a week or as often as they could, the would meet to refurbish the pews. Each family did their own pew. One of many memories in this building was the Easter morning sunrise services. Immediately following the service, a breakfast was prepared and the congregation would go to the upstairs fo the building to enjoy their breakfast. As they were eating, the sun would start rising and sunshine would pour into the windows. It was a sight to behold. On January 21, 1962 they withdrew from the Wisconsin Synod and joined the Missouri Synod. It was during this time that the started to have a dream of building their own church. On February 14, 1968 they purchased approximately 2-1/2 acres from Margaret Middleton, which was part of the Alex Simo farm. During the 1980's, they started concentrating on building a church of their own on this acreage. A building fund was established on January 2, 1982. The congregations' first bake sale was on September 1, 1984 and the first bazaar was held on December 8, 1984. Between the years 1982 through August of 1989, the congregation had raised $40,000 through bakes sales, bazaars, and the generous donations of the community, visitors, various churches, etc. In 1985, the bank building was sold to the Lions Club, who still use it today. In July of 1988, contact was made with the Laborers for Christ to help build our long anticipated church. The architect for our building was John T. Meyer with Wigen, Tichell, Myer & Associates, Inc. We received financial assistance through Church Extension fund. The members worked diligently to clear the land for their new church. The ground breaking took place on Sunday, October 16, 1988 with 23 people in attendance. The storage shed was used as a work shop, kitchen, dining room, bible study, and fellowship. The ladies of the church would bring bake goods up everyday for a 10 a.m. coffee break and fellowship hour. In May, The Laborers for Christ thought it would be fun for Our Savior Lutheran Church to enter the annual Glennie Memorial Weekend Outhouse Race. Our outhouse was entitled "Running the Devel Out of Town." The runners and pushers were dressed like angels and a small child dressed like the devil sat in the outhouse. We won the Judges trophy. On August 13, 1989 at 8:00 a.m., a Deconsecration Service was held at the old church and at 3:00 p.m. and a Dedication Service took place in our new Church. One hundred and eighty-eight people took part in the dedication service to help us celebrate. Ms. Joann Arnold of Oscoda graciously donated an organ to our church at this time. On September 17th, the eternal light was purchased from contributions given in loving memory of George Nuffer, who was a long time member. In 1992, the congregation began talking about paving the parking lot. September of 1993 was the start of construction on our new driveway and parking lot. 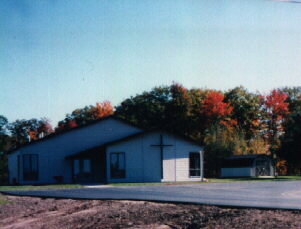 In 1993, the congregation bought the existing pews from a Catholic church in Saginaw. The men of the church refurbished them. What a beautiful addition this made to our church. The town of Glennie was celebrating their centennial in the summer of 1994, and all businesses, civic organizations and churches in the township were asked to participate in the annual 4th of July parade. Three community churches (Our Savior Lutheran, The United Methodist and The Seven Day Adventists) combined their talents to design and build a single float. The theme of this float was "LOOK UP TO JESUS." Our church also had a booth near the ball field and sold polish dogs and kraut, grilled bartwurst, coney dogs and pop. In 1995, Our Savior Lutheran entered a float in the Glennie's annual 4th of July parade. The theme for the parade was "The Flag." Our float was red, white and blue with a drawn picture of the United States. Inside of the United States picture was drawn an outline of the state of Michigan and two stars signifying Glennie and Our Saviour Lutheran Church. Bordering the top of the picture were the words "One Nation Under God." Our Savior Lutheran captured the second place trophy. The information on this page is meant for personal genealogical research only and is not intended for commercial use of any type.